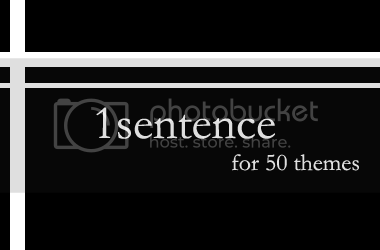 Below is information about the "One Sentence for Fifty Themes" asylum on InsaneJournal. To join this asylum, click here. You may leave the asylum at any time. Welcome to 1sentence, the mirror community for 1sentence on livejournal. How it works is simple. You claim a pairing of your choice and write one sentence for each theme about them. 1. First, join the aslyum. 2. Check the Claims List to make sure your claim is available. Comment here to make a claim. You will be given posting access once your claim has been approved. 3. The same claim may only be claimed twice at any given time. And members may have up to two claims at any given time. 4. Be respectful. Please no bashing/flaming/trolling. This is your only warning. You will be banned on your first offense. 5. Only post your sentences when you have finished all 50 themes. 6. Tag your post with the fandom only. Makes adding them to the memories easier for me. 7. If you're going to be posting more than one claim, please do so in seperate entries.